Sit back and relax on the tiled heated seating while the starry sky glows mysteriously above you and soft music plays in the background. 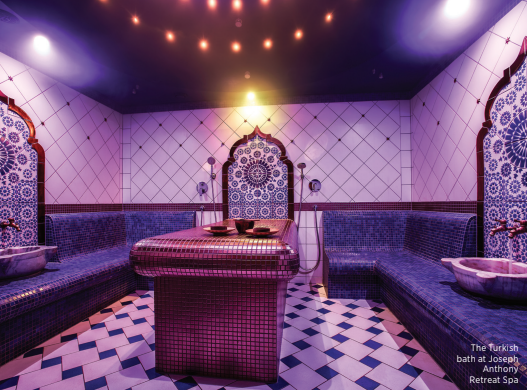 Enjoy a luxurious body polish on a heated, Italian tiles table. Each full body treatments includes a blend of natural ingredients that will exfoliate your skin followed by a gentle rinse leaving you feeling soft and velvety smooth all over. Cover your body in detoxifying muds or nourishing exotic cream and oils while breathing in herb infused steam and ice cold fog, followed by an intense warm rain shower rinse. Joseph Anthony retreat spa soft pack float treatments are one hour of pure euphoria, starting with a gentle body exfoliation treatment. Following is a sumptuous wrap treatment and a heavenly float on the soft pack system, in a pressure-free cushion of water. While relaxing, you’ll receive a body scrub, scalp and facial massage, and light application of cream or oil to your body to calm your mind and soothe your spirit. This treatment of pure decadence is recommended for dry, sensitive skin. You’ll be covered head-to-toe in ultra-rich Swiss Goat Butter Créme and nourishing oils. This nourishing wrap will leave your skin feeling hydrated and refreshed. The use of Swiss apple stem cells, which have an anti-aging property, will rejuvinate he life expectancy of the skins stem cells. Our luxurious body polishes are performed on the heated hamam table, whose warm, contoured surface provides the ultimate in comfort. Each full-body exfoliating treatment includes a blend of natural ingredients followed by a gentle rinse, to leave you feeling soft and velvety-smooth all over. This gentle body exfoliation combines the extraordinary absorption rate of grapeseed oil, the gentle exfoliation from sugar, and the benefits of aromatherapy. Refreshes, nourishes and smells wonderful. Coconut Oil is healing and has antibacterial and cleansing properties, with high levels of lauric acid and Vitamin E making it a natural moisturizer. Enjoy a flawless application of self-tanner. Please wear loose clothing to and from this treatment and wait seven hours to shower once the tanner has been applied. An Eastern Asian Massage for total relaxation. Two treatments combine warm oil and heated fragrant fruit sachets to create a warm relaxing massage. Beneficial effects include cell renewal, revitalization, and glowing skin. Massage is a natural rejuvenator, and practically a necessity of contemporary life. Its stimulating, cleansing, and healing effects can bring balance to the mind, body, and spirit. With a range of effective techniques literally at their fingertips, our licensed therapists can recommend the approach that will best suit your unique needs. Enhance the benefits of your massage with our Alpine Herbal Steam Therapy Enhancement. This detoxifying therapy will stimulate your metabolic system, leaving you feeling fresh and rejuvenated. We provide professionals at every level to best suit the needs of our clients. Our staff works on a European Level System that measures experience and years of dedication. Those at higher levels are more often educators, teachers and lecturers, as well as therapists. However, all of our professionals work with confidence and pride because of our extensive educational programs. We realize that a change in therapist from time to time can be refreshing. Please do not assume that a massage therapist or esthetician’s feelings will be hurt if you decide to change. We work as a team! As the region’s most advanced day spa, Joseph Anthony offers a full range of traditional treatments that blend ancient principles with the latest scientific techniques. Choose from our menu of luxurious services for your body, face, hands, and feet. Then, simply relax and let our professionals soothe, restore, and stimulate. Add aromatherapy oils to any massage for $5. Melt away, while warm smooth rocks are used to relieve stress, ease muscle tension, and promote a deep sense of overall well being; the ultimate relaxation experience. Experience synchronized and free form massage at its best with Joseph Anthony’s signature four-handed Massage. Two practitioners on one body proves not only to peak one’s senses but relaxes in ways that are beyond comprehension. A true relaxation massage, this unique wood based treatment combines heated Rosewood and Bamboo instruments with a custom blend of oils, designed to ease tense muscles while creating the ultimate relaxation escape. A modified form of Thai yoga bodywork where the therapist uses parallel bars overhead for balance. Compressions and passive stretching are applied with the therapist’s feet. This modality can be incorporated into Ashiatsu massage. A barefoot massage technique using deep compression strokes that glide over the body. Gravitational force is combined with fluid movements, creating a structural change in chronic soft tissue damage. This provides deep relaxation, stimulates the lymphatic system and increases range of motion in legs, hips, glutes and entire back. The Joseph Anthony Signature Facial has been developed to deep-cleanse your skin, remove impurities, and promote a healthy glow. Following a personalized skin analysis, our specialists will exfoliate, steam, and massage your skin with fruit, vegetable, and herbal products matched to your specific skin type. This facial is customized for acne, sensitive and dry skin types. Turn back the clock with Avance’s Vitamin C therapy, age defyer daily moisturizer and skin regeneration treatment. This sophisticated treatment diminishes fine lines, smoothes out wrinkles, repairs environmental damage, and minimizes age spots. Choose from a calming or stimulating treatment, and follow up with a home care regimen to keep your skin looking young and refreshed. This treatment will immediately transform the look and feel of your skin. A unique three step layering system consisting of a combination of powerful anti-aging vitamins and antioxidants, delivered with the use of oxygen under pressure for optimal penetration. This treatment is designed to be the ultimate in rehydration and radiance. Your skin will be resurfaced and exfoliated to leave it feeling supple and soft followed by the three step layering system of hyaluronic acid infused into your skin with the use of oxygen under pressure. Results in optimal rehydration.